My name is Suzanne Perry. I was controlled and beaten for over 20 years by my partner. Over those years, I lived in a virtual prison. I was plucked from from society at the tender age of 17; and my confidence and dignity were slowly peeled from me, layer by layer. I suffered the shame associated with going to work with black eyes, fat lips, cuts and bruises. Strong enough to leave and weak enough to return three times, and then I married him. Abusers know how to push our buttons and play us right back into their arms and control. The kids and I weren’t allowed to talk to each other unless he was present. He was paranoid that they would tell me how terrible and controlling he was while I was at work. His paranoia started getting the best of him, and I was getting raises and promoted at work, the beatings and false accusations became more frequent and more severe. Finally, our daughter, then 16, insisted that she couldn’t stand this life anymore and promised me she was running away if I didn’t act. A year earlier, I had gathered up the courage to make a phone call to the local police asking what could be done to help me. After getting referred to different jurisdictions, voicemails, and getting completely enraged at the lack of true direction, I was told that in New York State , I could have a black eye, and nothing could be done. Yet, if I were to be kicked with a boot, then that would be okay because the boot constitutes a weapon. WHAT!? So, was I supposed to go home and ask to be kicked? Are you serious? It was that point my glimmer of hope was doused. Our daughter and I pade a pact that she could call 911 but only when I said it was ok.
Left with nothing but my job, we finally moved to a 1,000 square foot house on a rent-to-own basis from a friend of over 15 years who knew the life of torture that I endowed and was elated to see me and the kids out of it. Soon after, my employer couldn’t make payroll and laid off its staff. I did well for 2 years, but the recession finally made it near impossible to compete. I created a nonprofit company, OP Music House, which takes my experience and adds music, my life-long passion from a historian and appreciation standpoint. The 2 items are this: a music venue and basic recording studio for 16-24 year olds where local musicians hang out, offering tips tricks and jam sessions. The other prong is support services for anybody impacted by domestic violence or abuse. The latter function I have been doing for nearly a year now, helping people across the country. I give them acknowledgment to let them know they are not alone, and that I have been through it and can guide them into what comes next, what the stages are in and after an abusive relationship; and that there is always hope. In one year’s time, my Facebook page has over 4,100 friends. I write all over the internet about DV, inner peace, breaking down the walls of judgment, and I also promote local music. Today I speak at colleges and organizations about my story and about the power of positive. I write for the Examiner and for Yahoo. I have some radio shows debuting in 2011, one for relationship advice and the other on the local Buffalo music scene. I have a monthly live music and entertainment show called “Suzapalooza” which promotes original music. Where most clubs say ‘no’ I say a big ‘YES!’ I’m a medium for the underdog; I don’t like mainstream anything. I created the EXPOSURE Concert: Because love shouldnt hurt. It was August 13-15, 2010 in Blasdell, NY. Forty-seven bands played. The entire concert was broadcast live around the world. It was viewed from 8 countries and 34 states, all to expose domestic violence. 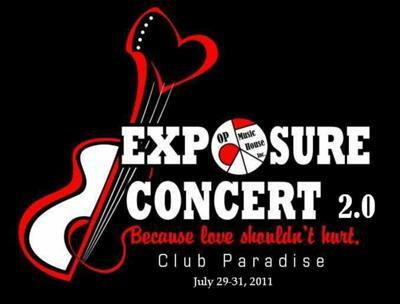 The 2nd annual EXPOSURE Concert is July 29-31, 2011. It will again stream live around the world. Survivor, Sharen Wendy Robertson from Cape Cod closed the last show, she’s going to kick off this one. The excitement is brewing. OP Music House is a registered nonprofit charitable organization and donations are tax-deductible. I hope to collect enough money through fundraising and donations to get our building and 2 staff, (myself being one of them), and I hope to get a tour bus donated, or even find one on Craigslist. Suppressed no more, shushed no longer, I hold high a virtual lantern of hope to those in the dark, and am a voice for the silent or the scared. 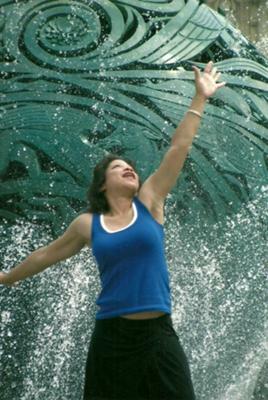 I provide confidence training to pick people up where a controlling abuser has left off. I collect toiletries and household items and turn them into “Take the Reins Care Paks” because I know what I wished for when I was suddenly alone with kids and dogs and no money. Since I hear hundreds of stories from all over the country, it builds my knowledge base on different cases and scenarios.